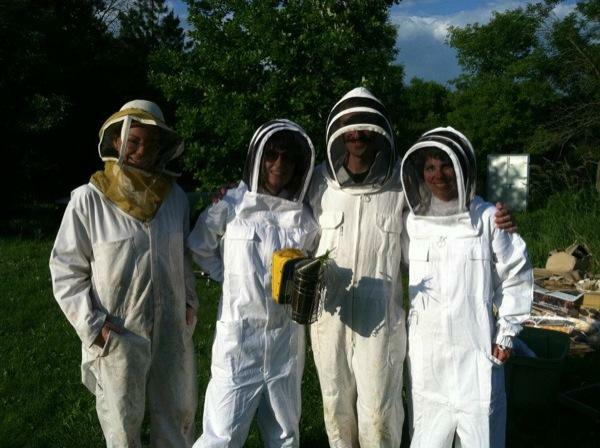 ABC’s of the Beez Kneez: A Mission for Sustainability. 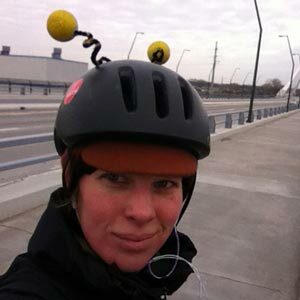 Three years ago, I attached some antennae to a bike helmet, painted my bike black and yellow, and started The Beez Kneez. At the time, I had no idea where it would take me. What I was aware of was my motivation, and it was two-fold: I wanted to work with bees, and I was very concerned about their struggle to survive. If bees pollinate 1/3 of everything we eat -- not to mention all the beautiful flowers and trees in our landscape -- and they are struggling to survive, I wanted to know: what did that mean for the future of food security? With a background in social science and fresh from an eye-opening experience living in Ecuador, I knew that there must be something that I could do to help the situation. Huh, I thought. Why not? 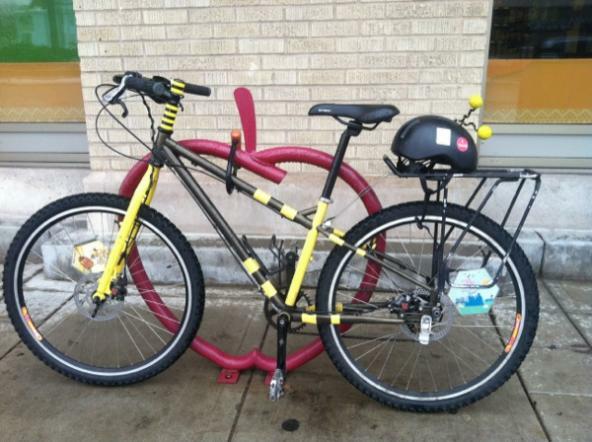 I immediately thought of using my bike, which had seen some MN winters and could use a paint job. Why not paint it like a bee? Halloween was approaching and so it only seemed natural to consider a costume. As I thought about it, it started to sound really fun. All I needed was a name, some striped socks, and antennae for my helmet. 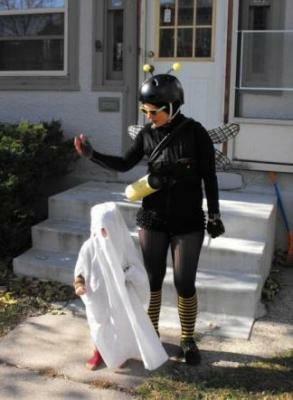 Little did I know that this was the beginning of my future, as some now yell from car windows, as the Bee Lady. From that moment on, I was on a mission. I made a website and handed out business cards. I had a custom trailer built and refined my delivery outfit. I started selling honey at the Kingfield Farmers Market in south Minneapolis and did events centered around food and bees. It was becoming increasing more difficult for people not to notice a giant bee on a yellow and black bike buzzing around the city. By going to people’s doors on my bike, I not only gathered attention along the way, I also learned that with every delivery, market, or event, I would connect to different sects of the Minneapolis community. Some would ask about honey, then the bees, and then my bike, and then back to the bees. Others would lead off with questions about bikes, then go into honey and then into bees. I quickly realized that I was serving different communities, first through honey (food), then bees, bikes, and back to food. Interest came from everyone: bicyclists, beekeepers, foodies, farmers, republicans, democrats, black, white, brown, young, or old. No matter who we are, food and ultimately bees are something we can all connect to. And then I noticed something. I noticed that the Beez Kneez had the potential to be something really good by simply providing something that was very tasty. 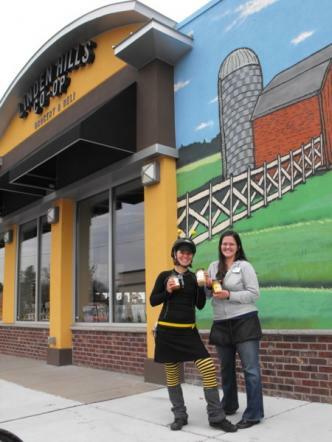 First Co-op to sell Beez Kneez Honey, 2011So after a year of being the "bee lady on a bike", I knew I wanted to somehow make this my career. I was doing something sort of strange, hearing all sorts of crazy comments and bad bee puns and working three jobs to support myself. Still, with every interaction in a community concerned about bees, with every person who smiled and waved, and even every time I saw my own shadow on the concrete complete with bouncing antennae, I found myself pedaling faster. These simple connections to my community built momentum. My dedication to the plight of the bee became stronger and the ultimate vision more clear. That summer I met Erin Rupp. After a conversation about combining our passions for bees, bikes, and experiential education, we dove in headfirst and built a new and important component of our business based on education called Community Bees on Bikes. 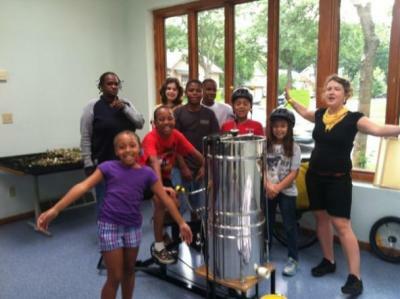 Lesson #3: Connecting Communities, Community Bees, The Beez Kneez Honey House and an Audacious Kickstarter Campaign! Over the course of a year, Community Bees on Bikes established 12 honeybee hives in 6 different host sites around the city. Working with a variety of community entities such as public parks, schools, urban farms, and community gardens, we taught classes to over 150 adults and kids by opening working beehives and giving the public a firsthand experience with, what are in my mind, some of the most complex and important social insects on the planet. After that year, Erin and I knew that we wanted to continue this work. It was essential, it was satisfying, and people were showing up. However, we quickly realized that in order to continue, we needed a viable space to operate. Furthermore, by collaborating with the beekeeping community, notably MacArthur Genius recipient Dr. Marla Spivak and her program the Bee Squad as well as the MN Hobby beekeepers and Twin Cities urban farmers, we knew we could take our work one step further. We could share resources and space with others. So on February 17th, we launched a Kickstarter campaign to raise money to build an education center. In a way, we wanted to create a "hive" of our own to serve ourselves and our community in a our mission to save bees and agriculture. We wanted to "revive the hive". When I first learned of the problems that bees and other pollinators were facing, the cause seemed in some ways quite simple. We humans were messing things up once again. But how did we get so lost? How did we stray so far from what we fundamentally all have a relationship to and depend on for our survival? And how did it happen so fast? It is not just one thing or even three things that are killing bees; it is not simple or good or even tasty. It is complicated, messy, political, and daunting, and it leaves a foul taste in your mouth. In an effort to be more efficient, feed people, use food crops for non-food items, and make massive amounts of money doing so, we have drastically changed the way we think and therefore the way we practice agriculture. In effect, we moved further away from and deprioritized the very fundamental need of all living things, food. We also singled out desired end products and lost sight of the whole system that must be nurtured to produce good food. Those of us who have moved further away from the country and become more immersed in the suburbs and cities have gotten even more disconnected as we strive to have what we want instead of taking care of what we need. The only way to get back to a place of balance is to begin to help and hold the very things we worked to destroy. The Honey House will be a beginning, a meeting place to begin building a movement by educating a community. More than that, it will be a model that we hope other communities can adapt in order to start imagining a sustainable world, full of happy bees and healthy gardens. Editor's Note: The Beez Kneez has just a week left in their Kickstarter Campaign which ends March 31st, and they're just short of their $35,000 goal. Please watch the video above or go to their Kickstarter site and help them help us. Kristy Allen was born and raised in a small town in central Minnesota and watched the landscape change from farmland and wide-open spaces to cookie cutter development. Feeling restless, disgruntled and sheltered, she was thirsty for knowledge and experience. After spending many years traveling, studying, volunteering and working all over the world, she found herself in central Arkansas where the nostalgia of wide open spaces and farmland solidified an untapped passion. It was here where Kristy first learned about the problems facing pollinators, specifically honeybees, and the vital role they play in agriculture. That same year her aunt and uncle invited her to learn their trade at Bar Bell Bee Ranch in northern MN. After one time in a hive with her uncle, she fell in love with bees. Now she spends most of her time masquerading as one.